The year out, or internship, in a professional practice can be the most rewarding experience in an architectural student's education. It can also be a shock to the system to find that architectural working practices are very different to architectural study. This book provides a beginner's guide to professional practice and a step-by-step guide on how to find the placement that best suits your goals. It is the fourth title in the successful 'Seriously Useful Guides...' series.In order to give you a real insight into professional experience, this guide includes reallife case studies from students who have been through the experience and from practices that have taken them on. It guides you through the steps of finding a placement, outlines the norms and expectations for internship in different countries, and discusses codes of office behavior and professional ethics. 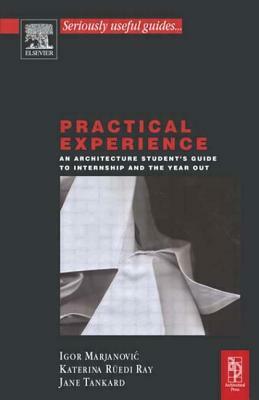 Contemporary architecturalpractices are becoming increasingly diverse and this guide outlines some Practical experience/Internship choices, providing cases studies of award wining firms that offer practical experience. These case studies range from conventional practices based on the art of building, to practices based on digital media or contemporary urbanism. Finally, the term 'critical practice' is becoming increasingly important, and the book provides some definitions and examples of critically based architectural practices.Also in the Seriously Useful Guides Series: * The Crit* The The Portfolio* The Dissertation.